PT Indah Karya (Persero) - PT IK or more popularly called "Indah Karya" is an Indonesian state-owned company, running business in the sector of professional, engineering and scientific services. Indah Karya concentrates its business activities in the field of engineering and planning consulting company in Indonesia. Originally registered as Ingenieurs Bureau Ingenegeren Vrijburg NV (IBIV-NV) during Indonesia's colonial days. 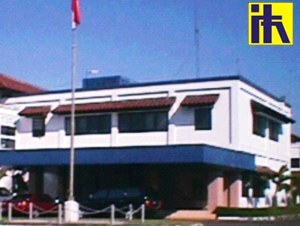 PN Indah Karya was formed in 1961 as a nationalization results of IBIV-NV. The name of PT Indah Karya (Persero) officially established in 1971. Headquartered in Bandung West Java, Indah Karya now has 1 Jakarta representative office and 7 branch offices spread across Indonesia. Its branch office located at Banda Aceh, Medan, Padang, Palembang, Lampung, Bandung, and Surabaya. Indah Karya also supported 2 business units; Indah Karya Register Certification Services (IKRCS) and construction services unit (ELJEKA). Indah Karya was able to perform well and achieved encouraging results of operations in 2014. The state-owned company managed to record a total asset of Rp 43.5 billion at the end of 2014. This reflected an 66.03% increase from Rp 26.2 billion in 2013. The Company managed to record revenue of Rp 41.1 billion in 2014, an increase of 45.22% from the previous year of Rp 28.3 billion. Net profit grew considerably to Rp 5.4 billion, from Rp 3.5 billion in the previous year. This figures was stated by the Ministry of State-Owned Enterprise in its Indonesian State-Owned Company Profile 2014 as cited by JobsCDC.com. Minimum GPA of 3.00 on a 4.00 grade scale. Preferably fresh graduate for Planning Engineering, Industrial Engineering, Accounting, and Management, graduated from a reputable university. Experienced in their respective fields of at least 5 years (2 and 4). Honestly, Loyalty and highly motivated. JobsCDC.com now available on android device. Download now on Google Play here. Please be aware of recruitment fraud. The entire stage of this selection process is free of charge. PT Indah Karya (Persero) - D3, S1, S2 Fresh Graduate, Experienced Engineer Indah Karya June 2016 will never ask for fees or upfront payments for any purposes during the recruitment process such as transportation and accommodation.